Warning of an "unacceptably high" number of Russian spies in the U.S., the Trump administration said 60 diplomats would be expelled - all Russian intelligence agents working under diplomatic cover, the U.S. said. The group includes a dozen posted to Russia's mission to the United Nations who the officials said were engaged in "aggressive collection" of intelligence on American soil. The move was one of the most significant actions President Donald Trump's administration has taken to date to punish Moscow and Russian President Vladimir Putin, especially over its intelligence activities. The last time they spoke, less than a week ago, Trump congratulated Putin for his re-election but didn't raise the March 4 spy poisoning, Russia's alleged election-meddling in the U.S. or its own tainted voting process, prompting dismayed critiques even from Trump's fellow Republicans. "This is the largest expulsion of Russian intelligence officers in United States history," said U.S. Ambassador to Russia Jon Huntsman. The American penalties were echoed by announcements in European capitals across the continent, including those in Russia's backyard. All told, 18 countries were ousting more than 100 Russian spies, British Prime Minister Theresa May said, in addition to 23 already kicked out by the U.K. The list included at least 16 European Union nations, with more likely to follow. Germany, Poland and France each planned to boot four, the Czech Republic three and Italy two. Ukraine, a non-EU country with its own conflicts with Moscow, was expelling 13 Russians, President Petro Poroshenko said. All three Baltic states said they would kick diplomats out. Canada, too, said it was taking action, kicking out four and denying three who have applied to enter the country. The expulsions came with a chorus of condemnation for the Kremlin - for the poisoning, Russian spying and other Western grievances. Poland's Foreign Minister Jacek Czaputowicz called it "the right response to the unfriendly, aggressive actions of Russia." In the Czech Republic, where Russian officials have claimed the poison may have originated, Prime Minister Andrej Babis dismissed that allegation as "an utter lie." In Washington, Russia's ambassador to the U.S., Anatoly Antonov, was summoned early Friday to the State Department and told that the 60 diplomats would have one week to leave the country, the State Department said. Russia's Embassy in Washington responded on Twitter by hinting at retaliation, asking its followers to vote which U.S. consulate should be shuttered: St. Petersburg, Yekaterinburg or Vladivostok. Russia will likely respond quid pro quo using the "principle of reciprocity," the Kremlin said - a suggestion that Russia may expel an equal number of diplomats. Russia's Consulate General in Seattle must close by April 2. The facility is a particular counter-intelligence concern to the U.S. because of its proximity to a U.S. Navy base, said the senior U.S. officials, who spoke on condition of anonymity because they weren't authorized to be identified by name. The U.S. actions appeared to signal an increased level of concern about the extent of Russian spying in the United States. Senior officials said they estimated Russia had roughly 100 intelligence officials at its diplomatic posts in the U.S., suggesting that dozens will remain even after the 60 are expelled. "The United States and many of our friends are sending a clear message that we will not stand for Russia's misconduct," said U.S. Ambassador Nikki Haley, Trump's envoy to the U.N.
Britain had already expelled 23 Russian diplomats, accusing them of being undeclared intelligence agents, which led Russia to expel the same number of British diplomats. The European Union has already recalled its ambassador to Russia. The steps on both sides of the Atlantic Ocean add to a serious escalation of tensions between Russia and the West that has been building since the poisoning of Sergei Skripal, a former Russian military intelligence officer convicted of spying for the U.K., and his daughter, Yulia. The two remain in critical condition and unconscious. A policeman who responded to their home was also injured. 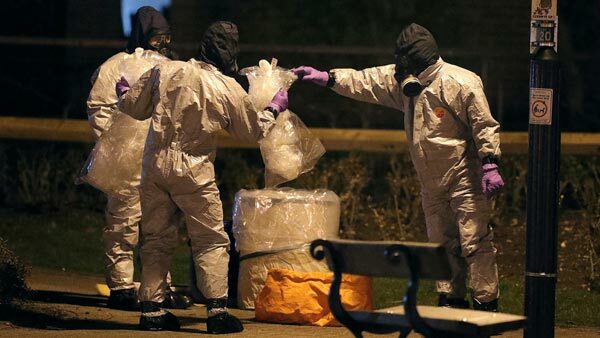 Britain has accused Moscow of perpetrating the attack using a Soviet-developed nerve agent known as Novichok. The U.S., France and Germany have agreed it's highly likely Russia was responsible. Russia's government has denied responsibility and has blasted Britain's investigation into the poisoning. Monday's expulsions appear to involve the largest number of Russians kicked out of the United States since 1986, when the Reagan administration expelled 55. The George W. Bush administration expelled 50 Russians in 2001 in retaliation for the Robert Hanssen spy case. In its waning days, the Obama administration expelled 35 over alleged Russian interference in the 2016 presidential election. Trump has repeatedly wavered on whether he believes Moscow was behind the election-meddling, despite assessments from U.S. intelligence agencies and the special counsel investigation into Russia's actions and potential collusion with Trump's campaign. But this month, Trump's administration hit Russians with its first sanctions for the campaign interference, and accused Moscow of an elaborate plot to hack America's electric grid and key infrastructure.